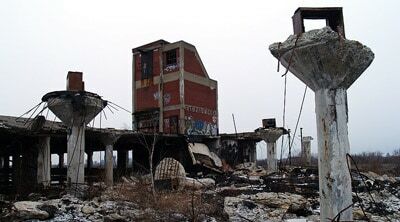 The campaign against Detroit is the latest battle in a long war against the American social contract. For that war to succeed, millions of Americans must be convinced to see their fellow citizens – working people, retired people, students, the poor – as the Other. From Social Security to decent jobs, from a life’s education to a living wage, the implicit agreements among us can only be broken if we think of our neighbors as Other than ourselves. That’s why Detroit’s fate is so important. Breaking Detroit’s pension agreements would pave the way for breaking our national agreement with all retired Americans, and then with the rest of our national community. The people of Detroit are not Other than us. They are us. And if we sacrifice their neighborhoods, our neighborhoods won’t be far behind. It’s true that Detroit is an extreme case. In places the landscape looks more like Fallujah or Kandahar than the typical American city. And the statistics are staggering: 40,000 buildings lie abandoned. 40 percent of the streetlights are broken. Unemployment and crime are almost unmeasurably high. Cities like Detroit may seem like the badlands of our economic war, outside that Green Zone of relative security where most of us huddle together and hope for survival. That makes it the perfect test case for the dismantling of the American Dream. Detroit just seems so … different. But it isn’t different, except in the extremity of its pain. The decimation of Detroit was caused by the same forces that have buffeted the rest of the country: NAFTA and globalization. Predatory Wall Street actions, including those that led to the 2008 financial crisis. The absence of a national strategy for revitalizing our cities. Detroit was hit harder than most places. But that doesn’t make it different. Detroit isn’t a stranger in danger. It’s a neighbor in need. There are good jobs in the Detroit area, but they’ve moved well outside the city. A lack of adequate and affordable transportation leaves many of the city’s residents unable to reach those jobs. Public transportation is a metropolitan area’s circulatory system, in both an economic and a human sense. Cut if off and the metropolitan “body” responds in much the same was as a human body: the isolated limb becomes gangrenous and rots away. There are all sorts of schemes for “saving Detroit,” many of which give corporate interests a higher priority than the needs of the people who live there. Felix Salmon of Reuters summarized two of them. Steven Rattner plan includes the idea that Federal aid should be based on the concept of “shared sacrifice.” That phrase, popular in certain influential circles, is usually deployed to describe cuts to pensions, Social Security, Medicare, or other earned benefit programs because they’ve been deemed fiscally necessary – often by the same economists who misread the economy in the decade leading up to the 2008 crisis. But those who deploy the phrase, like Rattner, rarely mention that the perceived fiscal need stems in large part from tax cuts for the wealthy and corporations, together with the impact of the Wall Street-created financial crisis. They emphasize the idea that elderly retirees should give up earned income, while bankers might – might – trim something off their ever-rising profit margins. Remember that: Investors got compensated for the risk. City workers didn’t. Neither Rattner nor Cassidy suggest asking the residents of Detroit how they’d like to handle this program. “Saving Detroit” rarely seems to include saving the people that live there. And in both cases the complicity of corporations, and the fiscal impact of tax cuts for the wealthy, is conveniently ignored. The tax breaks in their plan would increase the Federal deficit – which magically disappears as a concern whenever profits are involved. The plan itself would be far less economically efficient than a more obvious and popular solution, strengthening Social Security’s benefits. America’s corporations used to offer pension plans, like those promised to Detroit’s workers. Those pensions were essential to the financial security of the American middle class. But corporations quickly learned that they could save money by ending those pensions and replacing them with savings plans and other programs which offered negligible retirement security – and that workers didn’t fully understand the difference. “Giving them less and making them think it’s more” is now the policy of the AARP – and of many politicians in both parties, too. The media helps sow confusion, too. US News coverage of the AARP/Chamber plan incorrectly states that there is a “doomsday clock” for Social Security that runs out in 2033. The truth is that, according to current (and changeable) projections, the plan’s surplus funds will run out in that year. From then on, say the actuaries, the plan would be able to pay 75 percent of planned benefits. That’s hardly “doomsday.” Egregious and inflammatory misreporting like this reflects badly on the journalistic profession in general and bylined reporter Phillip Moeller in particular. The estimated 2033 deadline could easily be fixed in any number of ways: Polls show that Americans would pay more in payroll taxes in return for increased benefits, for example. The payroll tax cap could be lifted. A financial transaction tax would help the balance sheet while safeguarding the economy. But equitable solutions disappear from from the revisionist reporting of the shared-consensus crowd, where the words “shared sacrifice” really mean: They share, everybody else sacrifices. From Detroit to Social Security is not a long march. Along the way we could expect to see deeper cuts in education, job creation, and other vital programs. If Detroit is allowed to die, if its retired workers are deprived of their compensation, another bastion of our social contract will fall. It will reinforce the media myth which says our social contract is null and void, our future is bankrupt, our dreams dead. How can most communities survive if retired people are barely eking out a subsistence living, if young people can’t increase their earning power through education, if middle-class people can’t find decent jobs at decent pay? Who’ll buy the houses, keep up the lawns, pay the taxes that pay the parks and schools? It’s like they used to say under very different circumstances: There goes the neighborhood. It doesn’t have to be this way. Detroit can become a test case, not for gutting the American dream, but for building the American future. It won’t be easy, and the rich and powerful will have to share in the sacrifice, but it can be done. The people of Detroit aren’t Other. They’re us. It’s as true now as it ever was: As Detroit goes, so goes the nation.